The scripts of law are drafted into our public bodies. They define movements and gestures, unconscious reactions, behaviours and anticipations. What happens when the laws become a game? What happens when we redefine the rules as the visible surface of a playing field, blurring the distinction between unthinking movement and a conscious submission as participants? Everyday, citizens perform, on public surfaces, synchronised routines of elaborate moves. Through the simple act of walking in the city, we log into a system of rules and constraints, codes that regulate the circulation of citizens within urban space. They are sets of instructions, conditional statements, ultimately incorporating power; a structural force that plays into everyday life. The act of assembling in public space is both an individual and a group activity, involving figures, interplay and synchronisation. 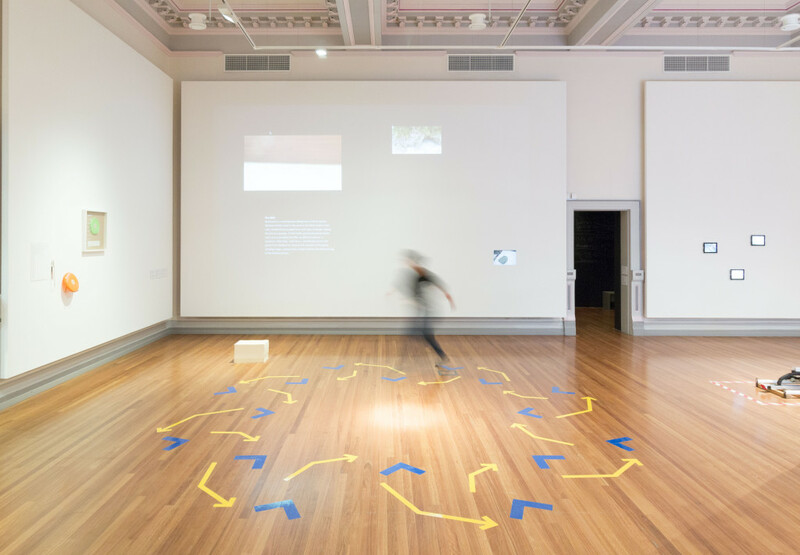 The resulting patterns and choreographies extend beyond exceptional events, to the most mundane of activities. It is not uncommon in the media, for example, to spot demonstrators keeping their march to one line, standing on the sidewalk, in Washington DC. Any reading or picnic gathering over twenty persons in one of New York City’s parks requires a special event permit. In Sweden, you might need to apply for a permit to dance in public. In Cairo one is allowed to spontaneously discuss public matters only if there are fewer than ten people. Some regulations surely sound sensible, some bizarre, many are contested and strongly conflictual. 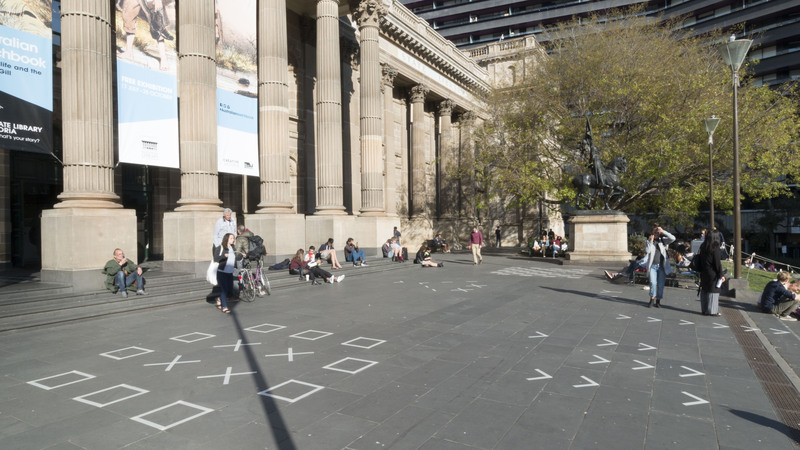 Friction Atlas — a project initiated in 2014 in Ljubljana and expanded in Athens and Melbourne — aims to make regulations — always implicitly present in any public space — explicit and legible through graphical devices. Through the engagement of the public, we attempt to make the dynamics of authority become not only visually but also physically discernible. 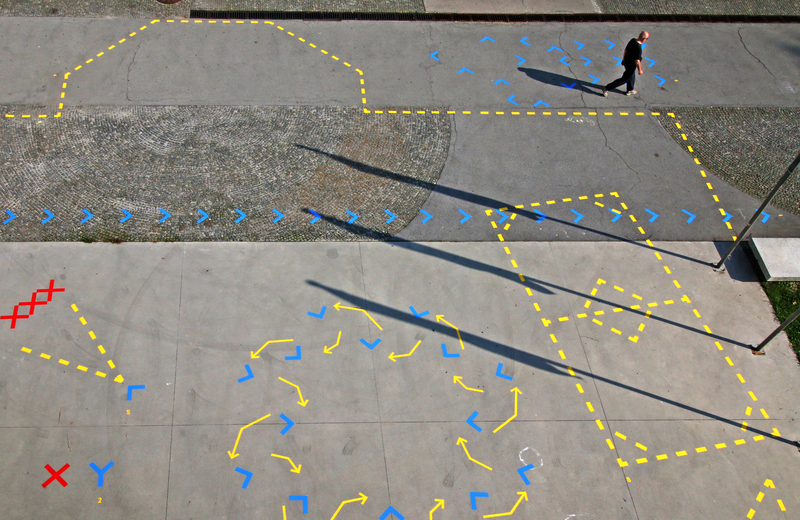 In each city, we drew full-scale diagrams onto the pavement of public spaces to illustrate the rules that control their uses in overlay with rules of other cities, such as Genoa, Cairo, Washington, Stockholm, Sydney. We sampled from different cities in order to show not specific conflicts, but the pervasivity of minor and daily frictions. We deliberately designed and arranged situations — collectively organising an environment and a play of events — that then resulted in actions, dérives, crossings of the city. 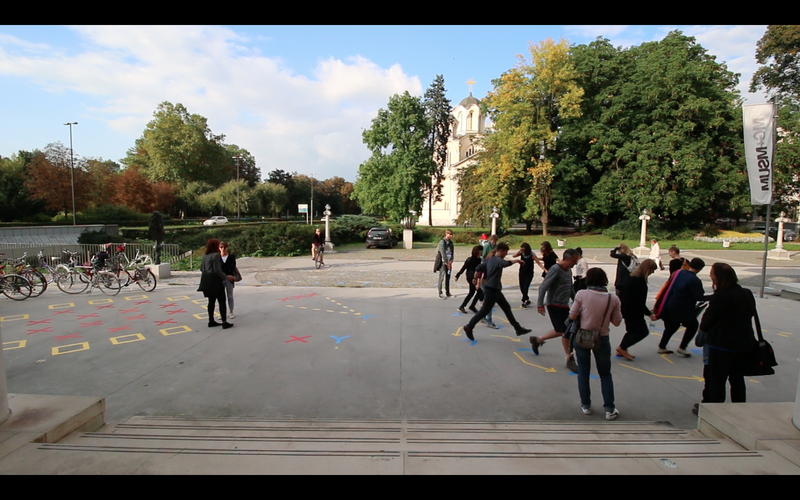 We invited the public to assemble, to participate in staged choreographies, to discuss, and reread the urban space, highlighting some of its hidden aspects. The way the urban is regulated still lacks tangible representation; law is often too murky, while ungraspable, to be discussed. Designed interventions can help in bringing to the foreground what is otherwise lost to view, neglected, or taken for granted as someone else’s problem — too thin, shadowy, banal, and invisible. When the structure and the activity of a system is exposed it becomes legible. The experience of the urban environment grants citizens a degree of agency when the resulting mental maps can be operationalised, to enable reprogramming, hacking, and deconstructing. 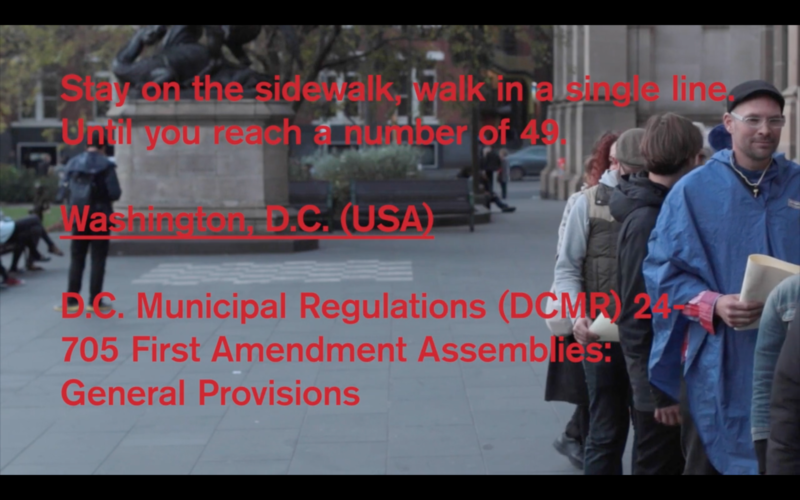 Understanding law as a human artefact, Friction Atlas highlights some of the regulations invisibly traced upon any urban surface, as in a playing field. Through graphical devices and performative practices, it reshapes local laws into fully visible agents, providing possible models for opening up to new forms of civic and aesthetic engagement with hidden or abstract layers of the city. Friction Atlas was initiated by Paolo Patelli and Giuditta Vendrame of design and research collaborative La Jetée for BIO 50, the 24th Biennial of Design in Ljubljana (18.9—7.12.2014). It was further developed within the Adhocracy Athens programme (29.4—4.7.2015) and the Performing Mobilities festival (17.9—31.10.2015) and in Melbourne, Australia. Thank you for your contribution Paolo and Giuditta. I consider it a great exploration of making the invisible in public space (laws and regulations) visible through ’embodiment’. I have one question, though: You say “The experience of the urban environment grants citizens a degree of agency when the resulting mental maps can be operationalised, to enable reprogramming, hacking, and deconstructing”. This sounds great, for it offers an opportunity for jumping from mere ‘representation’ (visualization) of the laws, to actual tweaking and interfering in the operations; but how do you see this happening? Was it already a case that the embodiment or (re)enactment of the scripts triggered a change that affected the behavior (or even the norms) on a long run? I think of Jeanne Van Heeswijk who organized around 100 interventions that ‘exposed’ the ridiculousness of market regulations in Rotterdam (getting a few thousands € in fines), which eventually resulted in progressive change of some of them. Thanks for your questions Pablo, spot on! Laws are human-made artefacts, they are given shape by man (or rather by a group or person in a position of authority), but are hard to grasp, to see, to discuss. By contrast, when we visualise the ways they literally “take place” in the space we inhabit — the actual shape they assume on the surface of a public space — passers-by are confronted with the possibility to literally “act on” them. They have to choose whether to literally walk-around the law, break it, or comply. This approach lacks the long-term community-specific commitment needed to produce sustained change on a tangible level, but nonetheless attempts to go beyond representation, by putting a (briefly) emancipated public before a choice. It requests to interact with law. It is playful, but interfering with the flow of everyday lives, it tries nonetheless to go beyond the emphasis on plain opticality. The atlas is on the ground. Moreover, Friction Atlas has provided us with the opportunity to encounter many different kinds of practitioners, locally. Lawyers, activists, police authorities, planners, choreographers, event producers have been involved in workshops and conversations, exposed to each other’s perspective. In our research, in fact, we look for and acknowledge more organised efforts, to reference them and in some cases feature them in our “atlas”. To tackle specific questions and work with more clearly defined contexts and groups, we would need a “spin-off” project, for which we are ready! Jeanne Van Heeswijk’s work would be a beautiful example to follow. And I have one more question, in fact: how do you see your role(s) as designers / artists / architects in this project? You say: “designers / artists / architects”. Indeed, we shift positions. 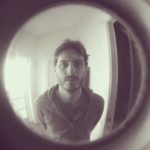 Maybe through artistic practice we try to rethink certain relationships, or to produce a more emotional kind of affect; as designers we then look for opportunities and developments. Also, if as an architect I tend to focus on space, as a citizen I am concerned about its politics. 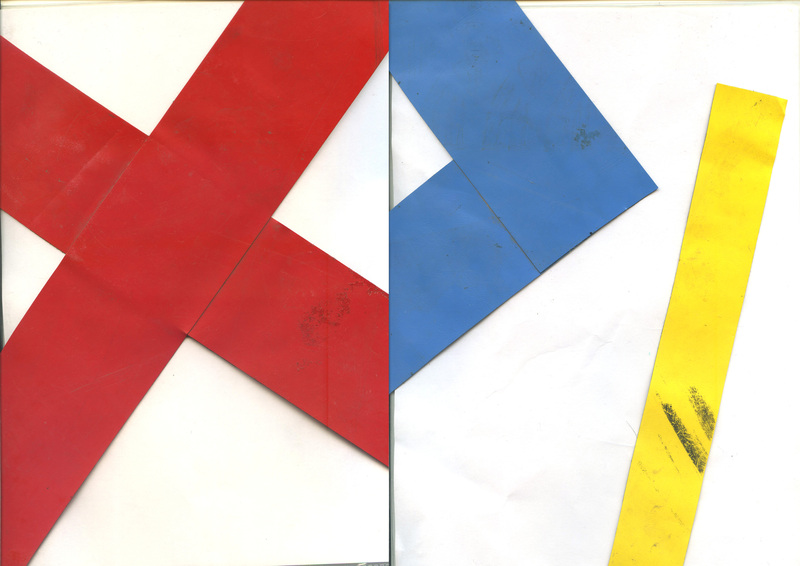 It is probably in between these roles that we try to reformulate, in this project for example, the delimitation of the visible and the invisible. I took an interest in this after seeing it in Ljubljana and wondered what became of it. What struck me most about it is how thin the veil is between our conscious and unconscious acts in space. One element is the set of cultural norms that guide our behaviour but perhaps more interesting is how quickly we accept and internalise the legal impositions, which arise suddenly in situations of ‘crisis’ (as in the case of Cairo that you outline). Do you differentiate between individual and collective ‘unveiling’ or awareness raising? Do you see the choreographies as political statements? And, similar to Pablo’s question, I’d be curious to hear how you see your own role and identity within this? Thanks Michael, very interesting questions. By allowing more to be seen than is usual of the often occluded, background processes and structures that regulate the ways we can assemble, we can potentially reveal our own occluded cognitive and cultural processes, and consciously observe them at work simultaneously, functioning as one. This “unveiling” can be individual or emerge from conversations. What is markedly political in this project, though, is in between the assembling bodies. Although in this project we look more at what bodies do — or can’t do — than at what they say, choreographies become political statements when, by representing — or rather, performatively uttering — public assembly, by always counting, naming, including, or excluding someone, they question dimensions of the political. Great, you describe it with such richness. It’s a simple but profound project. Thank you.